▪ The black antistatic transit boxes give full faraday cage ESD protection and can be foam lined to give physical protection to Printed Circuit Boards(PCB) during shipping and handling processes. ▪ Many other sizes and tailored designs, including special printing, available upon request. ▪ The black antistatic transit boxes can be supplied flat packed with no foam or supplied fully assembled with pink antistatic profiled foam. ▪ Material: antistatic corrugated fiberboard. 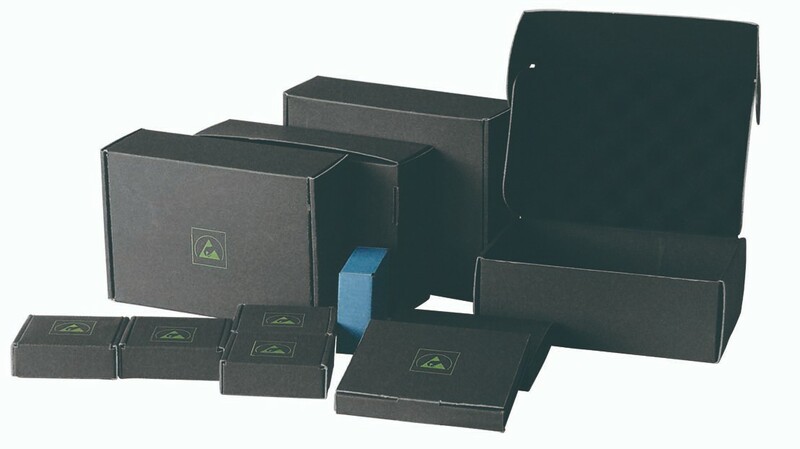 ▪ The black antistatic transit boxes give full faraday cage ESD protection and can be foam lined to give physical protection to Printed Circuit Boards(PCB) during shipping and handling processes. ▪ Many other sizes and tailored designs, including special printing, available upon request. ▪ The black antistatic transit boxes can be supplied flat packed with no foam or supplied fully assembled with pink antistatic profiled foam. ▪ Material: antistatic corrugated fiberboard.